Glenn Irwin has talked down the hype surrounding his rivalry with fellow Northern Ireland rider Michael Dunlop ahead of Saturday’s North West 200. Both riders along with 21-time winner Alastair Seeley are among the main favourites for victory in the seven-lap Superbike races at the Triangle meeting. Glenn Irwin on the PBM Be Wiser Ducati during practice on Tuesday. Irwin and Dunlop squared up to each other after clashing at a charity football match in January. The British Superbike contender later said he thought Dunlop disliked him because ‘I always beat him in a road race’. Seeley also revealed he has ‘never shaken hands’ with the Ballymoney racer, adding to the perception that there is no love lost between the Carrick men and Dunlop, who has kept his silence on the subject. Seeley and Dunlop are unlikely team-mates at the North West after the 15-time Isle of Man TT winner struck a deal to the ride the Tyco BMW Superbike at the international road races this year, while Irwin is back on the North Coast with Paul Bird’s Be Wiser Ducati team. The trio have all triumphed in the premier class at the North West and with battle lines drawn for Saturday’s showpiece races, Irwin has gone on the record to say he holds no grudges against any of his rivals. 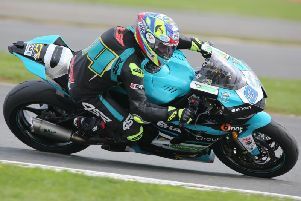 Carrick's Alastair Seeley has won 21 races at the North West 200. “I think people are trying to bill it as Irwin versus Seeley or Irwin versus Dunlop this year, especially after the charity football match. There has been a lot of that talk but I wish Michael Dunlop no harm whatsoever and I respect him,” the 28-year-old told the News Letter. “We’re rivals and I get it if some people find it hard to be friendly with their rivals, but I don’t want to turn this into a war going into the North West because I saw what can happen in this game at Macau last year. Irwin’s relationship with Seeley, meanwhile, has not always been a marriage made in heaven, but the pair have developed a strong friendship over the past few seasons. Michael Dunlop set the second fastest lap in Tuesday practice on the Tyco BMW. “My relationship with Alastair is as strong as it has ever been but our rivalry on the track will also be as strong as ever, there is no doubt. Irwin’s sensational victory in the feature NW200 Superbike race a year ago, which he won by a hair’s breadth following a final lap duel with Seeley, has set the bar high for Saturday. However, Irwin’s top priority today will be to get as many laps as possible under his belt after he was limited to only three laps in Tuesday’s shortened Superbike session. He is only competing in the Superbike class and did not have the opportunity to gain mileage in the other practice sessions in contrast to his main rivals. “I need laps under my belt and I hope Mervyn [Whyte, Event Director] can give us more time on Thursday,” he said.